I thought I better snap a photo and share my latest rug before I get too far along on it! You all know that when I get in a hooking mode and start a new one I tend to become a hooking maniac! LOL! I started this rug yesterday evening and hooked until about 12:30 am. The bear hasn't made a late night visit the last couple of nights! Unless of course you count the hubby out there in the darkness scratching on the window trying to scare me! NOT funny! 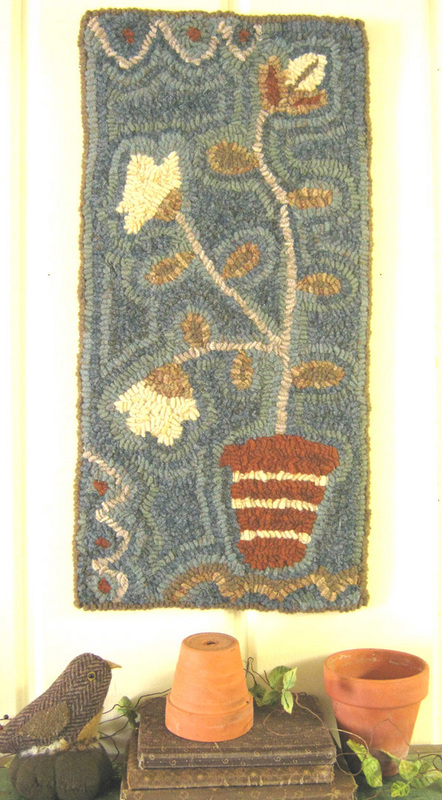 You'll recognize the design in this rug as the Clover Buds in Basket rug made famous in the book Seasons at Seven Gates Farm. Hooked many times by others .... my friend Lisa has hooked it twice of course. Well... it's my turn to hook it! I've chosen colors that I think are a bit unusual intentionally. Hooking in a 8.5 cut it's going nice and quick. I hope to get a lot hooked this weekend because next week is going to be a busy one. We are preparing for the big Quilt Event held at the St. Joseph's School Auditorium on April 6th. Is the poster in my blog header advertising the show big enough for you to see? LOL! That's a week from tomorrow! I'm working on a few necessities like some cute shopping bags for our customers! Jill and I are meeting tomorrow to decide on last minute display things and to try and keep each other focused! This is a big event for us and hopefully will be the exposure we need to grow our fledgling business! 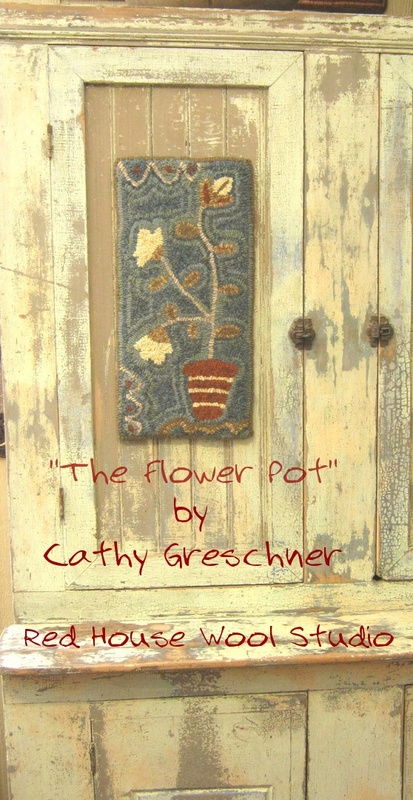 I must THANK all of you who ordered my new pattern "The Flower Pot"! They have been mailed and possibly some of you are already hooking it! 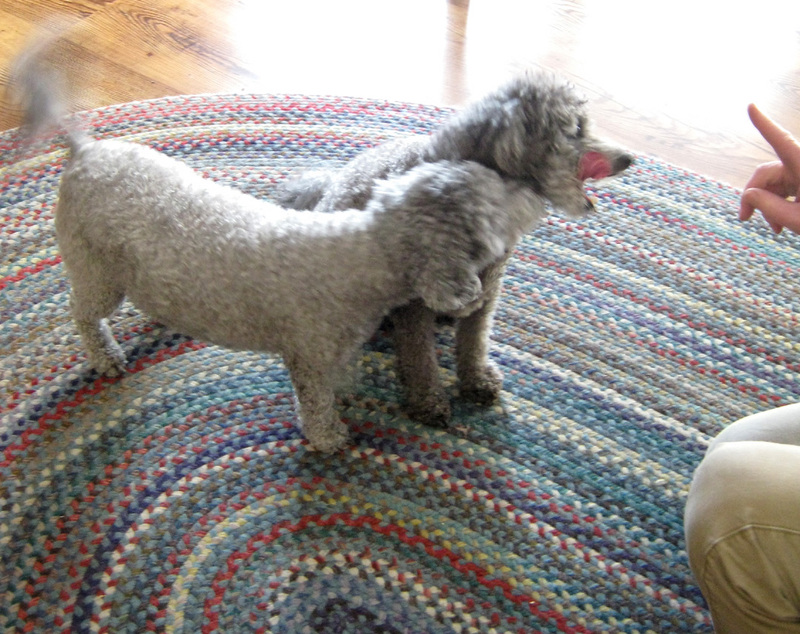 Don't be afraid to email photos of your rugs! It's my inspiration to see my patterns hooked by someone else! Hope to see you local friends at the Quilt Event... the food is awesome! It's all home baked and the pies are to die for! Maybe the name of this post should've been "Before I Get Too Fat!" LOL! About 11:30 pm last night as I sat in the studio near a window working on my laptop I heard what sounded like footsteps crunching in the snow. Not little footsteps like a dog or human would make. No... something much larger. More like something with big padded feet and some weight behind it crunching through the hard frozen snow in our backyard. I took a nervous quick glance over my shoulder to peek out the patio doors in time to see the owner of those big padded feet come strolling right past. If you count the panes in the window up to about 3 1/2 you should get the idea how big this creature was.... and that was standing on all fours! Scared the you know what right out of me! I've seen a few bears in my life time. But never one this close and with only a thin layer of glass between us! Since everyone else in this household has sense enough to go to bed early and were sleeping soundly I figured it was about time to rouse (him) and warn of the danger in our backyard. To make a somewhat long story short... in the dim light from the streetlights and waxing gibbous full moon we watched the hungry bear lumber through the backyard searching for the bird feeders ( which were already emptied by hungry birds). I have to say Mr. O sink was pretty excited as well. 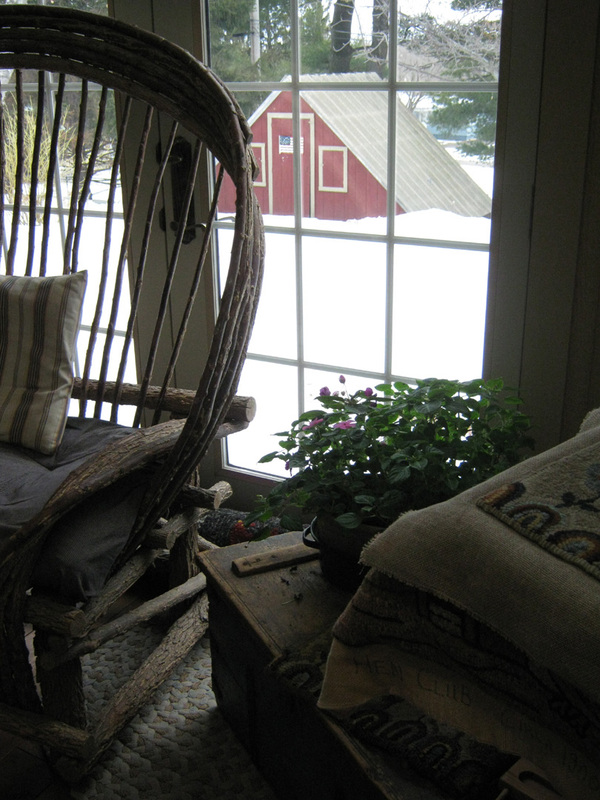 But not once did it ever occur to ME to open the patio doors and yell at the bear. Is that a man thing? Well it startled me and the bear of course went from a slow waddle to a lumbering gallop across the yard and scaled the big pine tree you see in the next photo (the one closest to the A frame). It's just amazing how a creature that big can climb a tree with such speed and the agility of a monkey. Okay Mr. O sink.... are you happy? Yelling at the bear didn't really accomplish much other than to have a 300 pound dog- eating beast resting in the pines in our backyard. Opps...before you know it the bear came right back down out of that tree! As determined as ever to carry on his search for food. The bears are awake from their winter hibernation and maybe as disgruntled as we are about the slow arrival of Spring weather. It has to make the search for food a little harder and perhaps the journey a little longer at night. We watched as he continued to make his way across the park and into the neighbors yard below us. So long story short... bears will be bears. 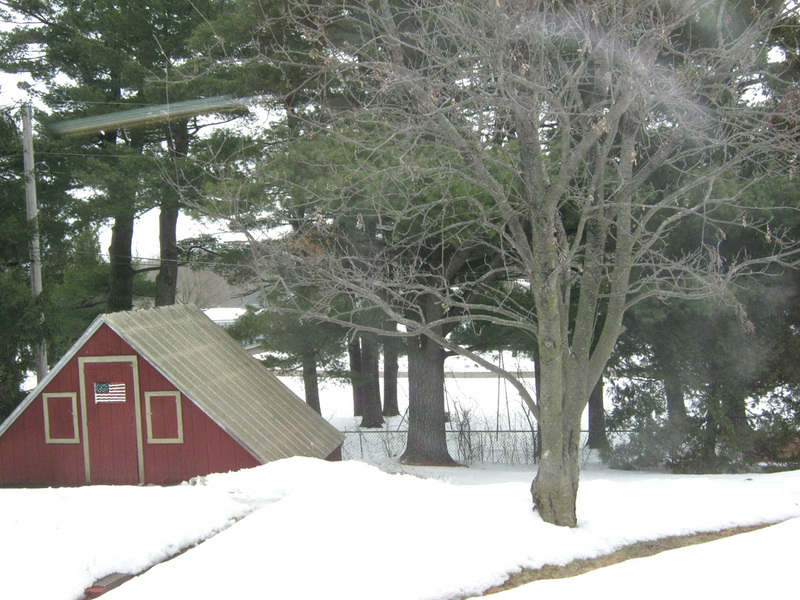 It doesn't matter that it feels and looks like the dead of winter in northern Wisconsin. The calendar says March 26th. The bears are awake. As good a sign as any I guess but I would much prefer to see a Robin. "The Flower Pot" My Latest Hooked Rug Design! What do you think of the name of my latest hooked rug design? 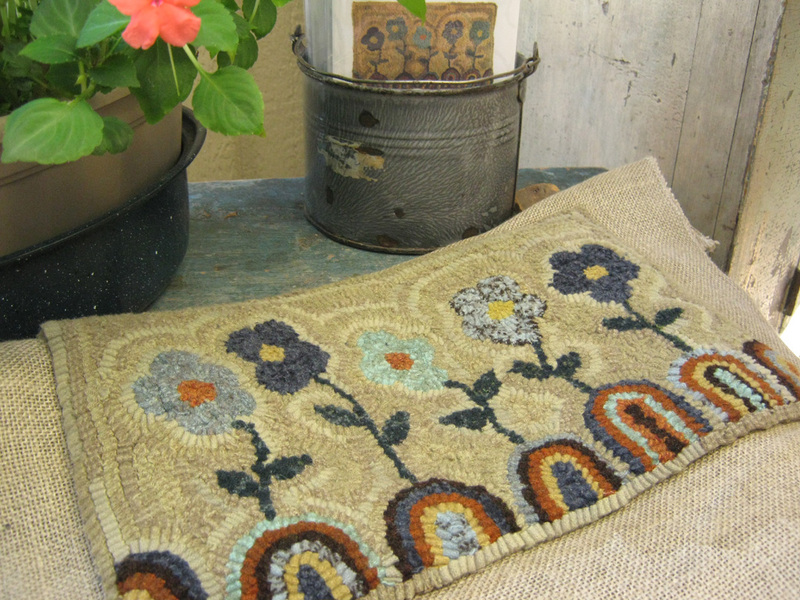 When I finished color planning and hooking this rug I was pleased with the overall results and a little stunned by how much the flower pot made its presence! So in my mind's eye there could be no better name for it than "The Flower Pot"! One of my favorite things about Spring is digging out the old terra cotta flower pots that I've collected over the years and placing them in little groupings around the garden. Some of the old ones have a mossy patina and some are decorated with stripes and the fading artwork of flower lovers of the past. You could say my design is kind of a remembrance to the old terra cotta pots. You can never have too many of them! 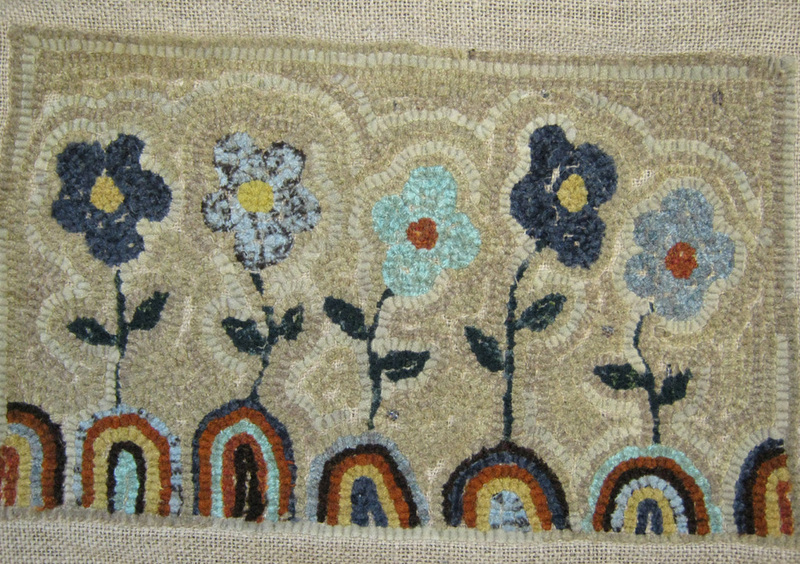 I hooked my rug using a wide 8.5 cut strip and used a #7cut for the stems to make them a little more fragile in appearance. But over all I wanted the rug to be very primitive so the wider strips worked well for that. The design measures 9.75 by 20 inches. It is a perfect size for those tall and narrow spaces and to hang on old cupboard doors! $10.50 which includes the postage. You are welcome to purchase the pattern here using the PayPal Button below or you can hop over to my selling blog for paper patterns and use the button there! Either way it takes you to Paypal to complete your transaction. I am happy to draw the pattern on premium quality Dorr Primitive Linen for those who do not want to transfer the pattern themselves. 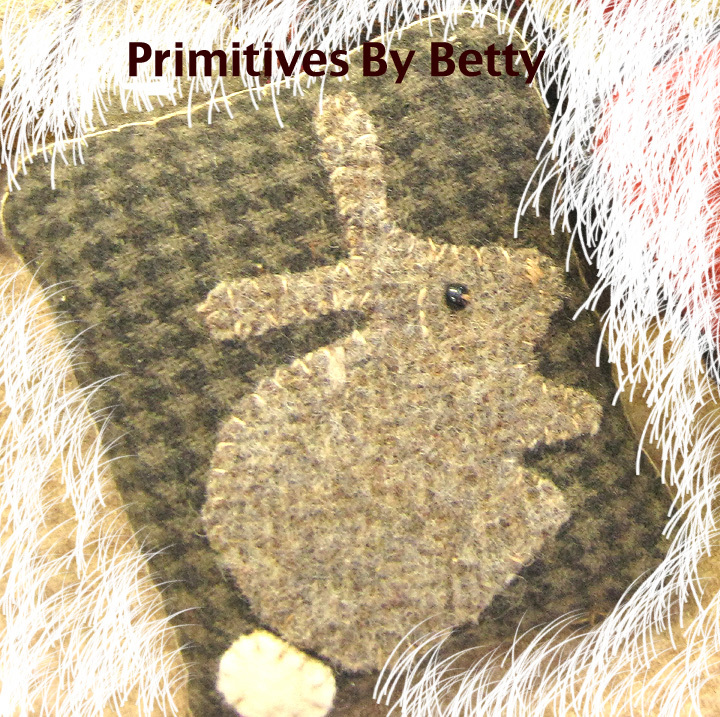 Cost for the pattern drawn on linen is $30.00 plus postage. Please email me to order the pattern on linen. I hope you like my new Spring design! 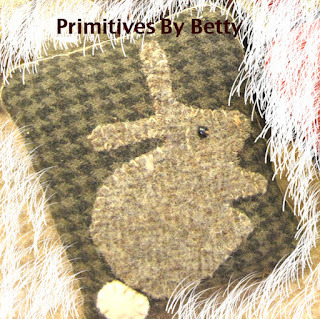 It was fun to hook and would be an ideal pattern for those new to rug hooking. I can't wait to hear what you think! Her new background mix has four different wools with just a slight difference in color and texture. The color is almost the same color as the unbleached linen. I don't know for sure if she is going to put it on her website.... but I will nudge her in that direction! Also I noticed in this rug as compared to the first one I hooked that my hooking as gotten much more even and well.... more like Jills! If you have ever seen one of her rugs in person her hooking is perfect and smooth! Almost like glass! Sheesh! Does hanging out with someone so much make you adapt their way of hooking? LOL! Almost as perfect as the front! Even more scary! LOL! Really sometimes my hooking can be as wild as my hair on bad hair days! And that is crazy wild! Do you find your moods are reflected in your hooking also? Goodness gracious it's been hard to maintain a good mood around here with the winter keeping it's grip on our part of the country! 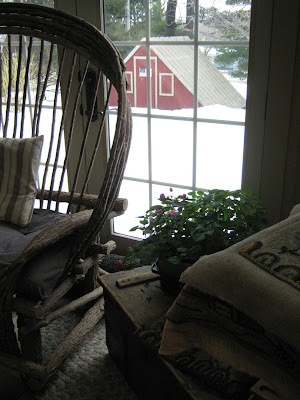 There is at least four feet of snow on the ground here yet! Even with the sun beating down on it like today it's going to take FOREVER for the dang stuff to disappear! Even our dogs are going stir crazy! 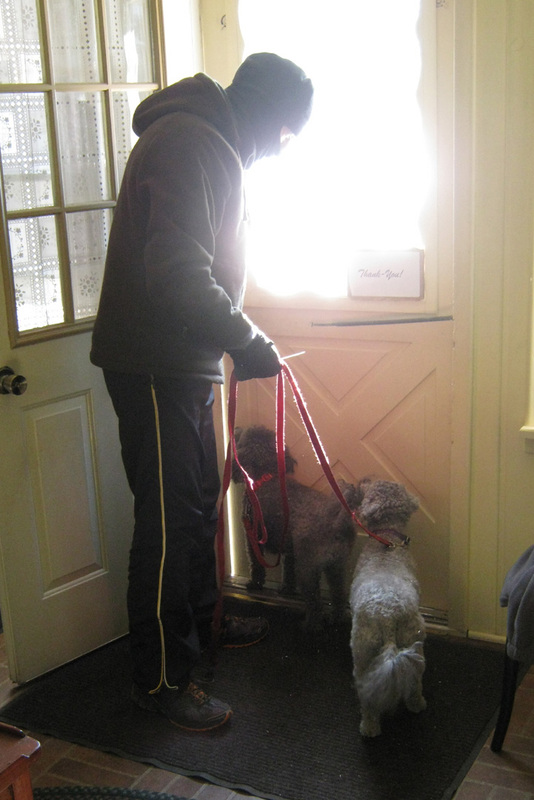 Dave has to give them a little talking too before their walk! They are so energetic and ready to tear out the door as soon as he gets home from work! They walk everyday no matter what the weather! Good boys! All three of them! Momma just sits home on her hinder hooking rugs all day!! LOL! There they go! Dave looks more like he's going to rob a bank in that ski mask he has on! LOL! But trust me he needs it in this kind of weather! One last thing I want to mention before getting back to working on my kits! Jill and I will be participating/vending in a wonderful Quilt Event here on April 6th. It will be held at the St. Josephs School Auditorium. It's a nice big quilt show with many vendors and activities! My Class!! Proud to be American Hookers!! 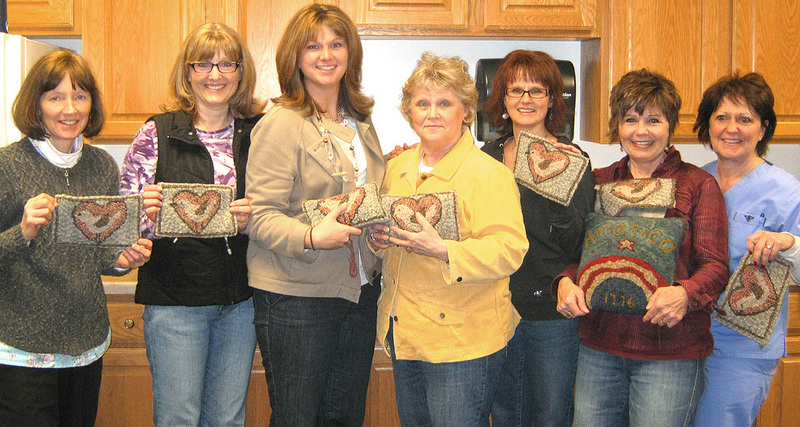 Well we made it through our beginning rug hooking class! Eleven lovely ladies graduated with flying colors! Last night was our final session at WITC. Four girls couldn't join us but will be visiting the studio in the next few days to finish their projects! 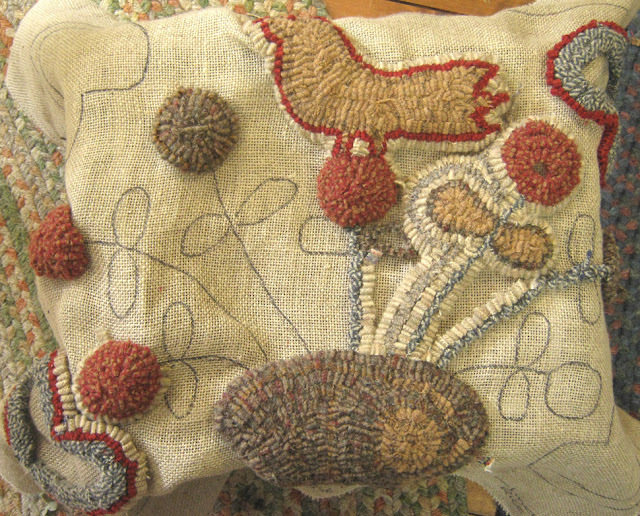 From the comments I heard last night everyone feels they learned enough about rug hooking to know they want to jump in with both feet and continue making rugs! 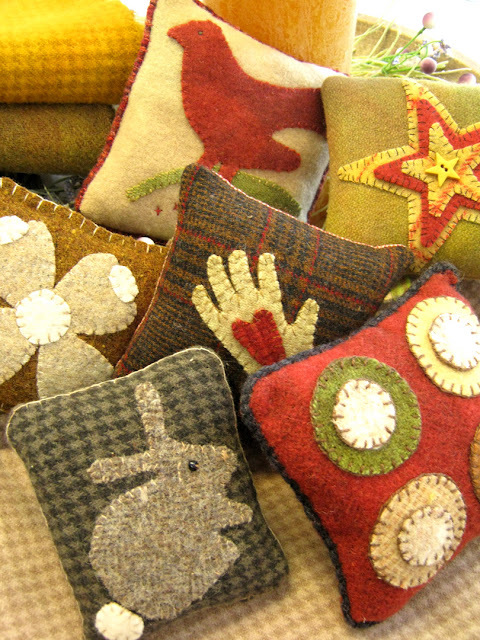 I know the studio will be hopping here this Spring as kits are ordered and wool will be snatched off the shelves! Renea is watching while Roxanne and Ashley are intent on sewing the backs on their little pillows! Renea is a talented carpenter and will be building rug hooking frames for some of the gals. The classroom was always a buzz with everyone at different stages in their projects! Connie wore her blue scrubs to class as she works at the hospital and had to go work the night shift after class! Does that speak of dedication or what!! All the ladies have very busy lives but I know they will make time for rug hooking! How do I know that? Well..... they are hooked!!! Congratulations to each and every one of you great ladies! 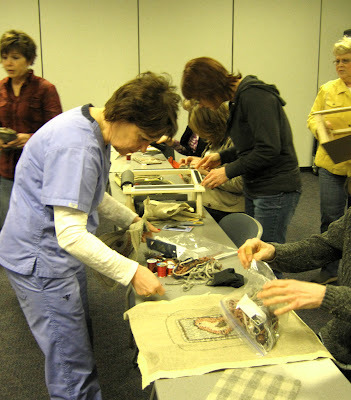 It was my first time ever to participate in a little pillow swap with my online friends! 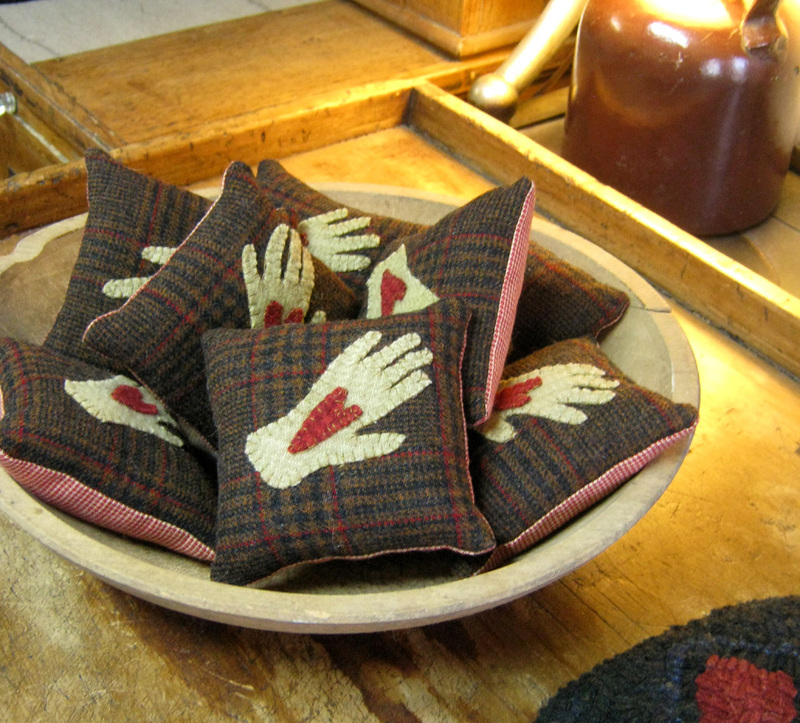 Kelley gave her time and brought us together so one day we could open our mailboxes and receive these little delightful hand made wool pillows! Wool on Wool! 4 by 4 or so! All hand stitched and stuffed and sent to Kelley! A hoppin' and swappin' little time we had! I hear whisperings of another towards Fall! My wool wheels are already turning! !